Collecting enough Halloween candy may seem like a big, big job for your little kiddo—but you know what the Paw Patrol theme song says: No job's too big, no pup's too small! That’s why this Paw Patrol Treat Bag will save the day when its time to trick-or-treat. Whether your child is dressed as Chase, Marshall, Rocky, Rubble, Skye, Everest, Zuma, Tracker, or Ryder, this themed treat bag will make them feel like they’ve got the force of the whole gang behind them as they knock on doors all night long! 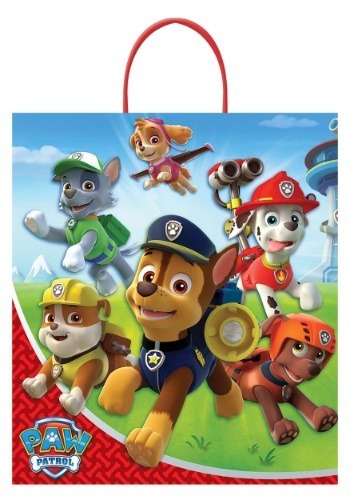 Large enough for a big haul, this plastic bag features solid handles and a totally fun Paw Patrol graphic! Don’t be surprised if folks stop your kiddo to help them out in a bind—everyone knows the Paw Patrol can fix any situation by working together. And if a mysterious candy heist is underway somewhere, your child will be ready to return all sweets to their rightful owner! This fun, printed pouch will have your little pup's tail wagging the moment they lay eyes on it. And a little sugar rush may be just what they need to fuel a full-scale rescue mission!